Adding protein to hair relaxer is a great way to get the look you love without the drying affect that normal relaxer can have on your hair. Chemical hair relaxers straighten your hair. Beauty salons are a smart place to go to have your hair relaxed by professionals or you can buy a kit that allows you relax your own hair right at home. If you haven't used relaxers or other chemicals in your hair before, however, it can be tricky. There are two basic types of hair relaxer - lye or no lye. Is a Protein Shampoo Right for Your Hair? Lye-based relaxers contain sodium hydroxide. While lye based relaxers create longer lasting and far more dramatic results than lye free relaxers, they can be dangerous for your hair and scalp. If you apply a lye-based relaxer to a scalp that's already irritated or if you leave it on too long it can cause scalp burns. Non-lye based relaxers are the better and safer choice, decreasing the odds of scalp irritation and hair loss if used correctly. Lye free relaxers contain guanidine hydroxide instead of sodium hydroxide. 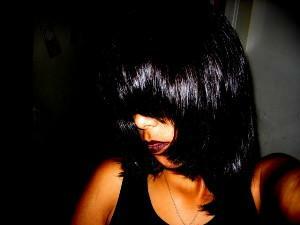 But it's not all sunshiny fun; non-lye relaxers can be just as bad when used incorrectly. These types of highly potent chemicals in relaxer actually change the hair shaft - thus creating a new look. Hopefully this will be the look you want. If you want to be absolutely positive that you're choosing the correct relaxer for your personal hair and scalp, talk with your hair care professional before making a purchase. Can turn dry, fizzy, thick, or crazy curly hair into a sleek and straight dream. It is a natural looking hair straightening style. You'll turn heads with your new look. It can take a lot of time to use relaxer correctly. The wrong hair styling relaxers can result in poor moisture. Relaxers increase breaks, split ends, frizz, and hair that can become virtually impossible to maintain and style. Lye-based relaxers can cause hair loss. Don't be afraid to try out hair relaxer to get the look you want. All it takes is a little savvy and some know-how and you're on your way to a new you. Adding protein can take a normally volatile hair product and allow it to work better for you. Why Use Protein with a Relaxer? Relaxers are chemical solutions that break the natural protein bonds of the hair. Adding protein can assist in keeping hair smooth and healthy by restoring some strength and elasticity to the hair, however, it is not possible to restore the hair bonds that are broken down during the relaxing process. Also be aware of what whether it is a protein treatment or a protein oil. Protein oils will add shine, but may not have the same benefits as the protein concentrate. Protein added to hair relaxer comes in a concentrated form. Wheat protein is used in many hair products; this is a milder form of protein. Animal proteins or hydrolyzed human hair protein are stronger forms of protein. The protein in hair concentrated additives and other hair products works by "sealing" the hair shaft. This results in healthier-looking hair. There are many brands available; read their ingredients and instructions carefully to choose the best one for you. Adding protein to hair relaxer or using relaxers containing protein can help in maintaining healthy hair, but other considerations are necessary. Read all the kit directions before you start. Always do a hair strand test before relaxing your whole head. Never use a relaxer on bleached or newly colored hair. Apply a thick layer of petroleum jelly to protect skin and scalp from burns. Don't use hot combs for one week before or after relaxing. Always rinse the product out well, according to the directions. Do all this and you can have a healthier hair relaxing experience at home. Ultra Sheen Supreme Relaxers: Enriched with fortifying conditioners that achieve maximum straightness while strengthening hair. Plus each box comes with 2 full applications. Available in two strengths, fine or normal hair and coarse hair. Used properly, hair relaxers can give you a sleek, straight look, and adding protein to hair relaxer can help make it a less stressful treatment for your hair as well.